December Newsletter and a FREE Founders Token! Hello everybody, it's Nibiru with a short newsletter to get you all caught up to date with what's happening in the AlterVerse. WOW, have we been busy! The AlterVerse team is growing! We have a new video! AlterVerse is in the media! Cool new concept art and more! Keep reading and find out all about some of the cool things we have going on! Check out the newest video on our AlterVerse Youtube channel. Then share it with all your friends and help us get the word out! Click the pic to watch! 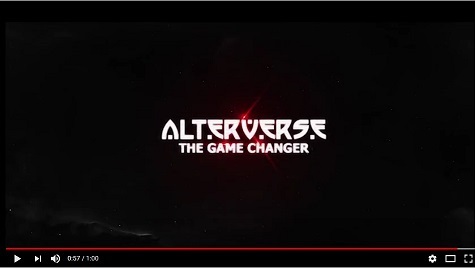 Our very own Scot Kinney, the founder & CEO of AlterVerse Inc., spoke with David Restrepo of BagoGames about the upcoming release of the AlterVerse! You can check out the new art on the AlterVerse home page and while you're there you can catch up on some AlterVerse Lore by reading the AlterVerse Story, then scroll down to check out all the new screenshots and videos in the galleries! We are happy to welcome several very talented people to the AlterVerse Team. Each and every one of them share our vision for the future of the AlterVerse. We are looking forward to working with them and are anxious to see their skills in action. You can check out all our Bios on the AlterVerse home page here. Blockchain driven - Blockchain technology is coming to the AlterVerse! The Devs are currently working on integrating all the necessary scripting to bring Blockchain technology into the game. Blockchain technology will provide us with an efficient and very secure method of handling and keeping track of all the assets and transactions in the AlterVerse. This will be the system to run our economy. The AlterVerse joins forces with Enjin! And there's a FREE Founder's Token giveaway! Check out this announcement here The AlterVerse joins forces with Enjin! and discover what Blockchain technology means for the AlterVerse! In the next update we’ll have some HUGE performance improvements. The devs are currently working on improvements and upgrades. Work on the 32 bit to 64 bit upgrade that I mentioned in the last update news is almost complete and the Devs are currently tweeking and fine tuning many parts of the game engine code. Plus, we'll have better controller support for VR, new opitmized textures, improvements on lighting, a new Bridge for the Disrupter ships, and even some new avatar clothes! There's still alot more to share with you all, but I don't want to make this newsletter too long so, that's all for this edition of the AlterVerse Newsletter. P.S. Remember you can always follow us on our AlterVerse Twitter and like us on Facebook and join the AlterVerse Discord and even subscribe to the AlterVerse YouTube channel to stay up to date with news from the AlterVerse!